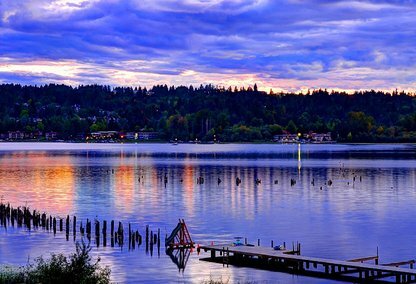 Lake Sammamish (pronounced "suh-MAM-ish") is a freshwater lake, seven miles long and one and half miles wide, formed by glacial activity. It is bordered by various parks including Marymoor Park at the lake's north end and Lake Sammamish State Park at its south end. Issaquah Creek feeds the lake, which then drains into Lake Washington via the Sammamish River. The East Lake Sammamish Trail runs the length of the lake (and then some) and connects to a 40 mile trail system that runs from Issaquah to the east, north to Redmond, Kenmore and Bothell, then south along the Burke-Gilman Trail to Ballard Locks at Puget Sound. With the impressive trail system as well as various state and county parks along the shore, visitors have plenty to do and see whether they want to stay for just the day or make it an extended visit complete with overnight camping. 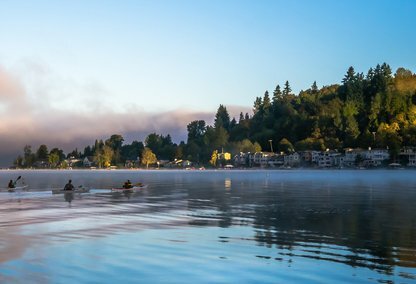 Bordering Bellevue, Redmond, Issaquah, and of course The City of Sammamish itself, Lake Sammamish is a thriving destination. The area surrounding Lake Sammamish has been, in recent times, the most rapidly growing suburban district in the Greater Seattle Metropolitan Area. During the late 1990s and early 2000s, the cities of Redmond, Snoqualmie, Fall City, Issaquah and Bellevue have grown substantially. The town of Sammamish was incorporated in 1999 because of suburban growth.